I have already written that I adore red color and that it is the one I would always wear. Therefore I can't nearly express my happiness when I saw Giorgio Armani Beauty cosmetic products in red packaging. Giorgio Armani, genius of world fashion, decided to expand and offer us all the pageantry of his talent in the field of makeup. Every bit of attention, care and dedication to each detail with which he designs clothing is matched by the effort and love invested in incredibly enchanting textures, formulas and colors of cosmetic collections. 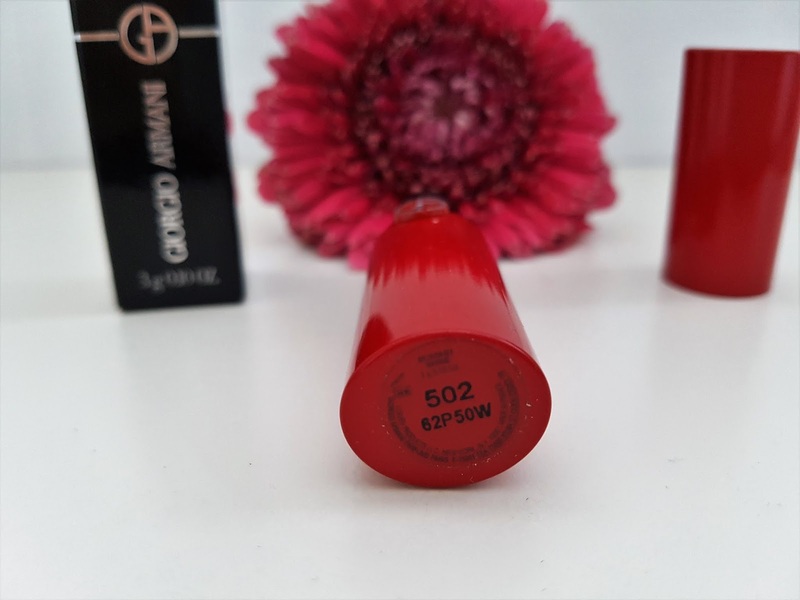 From the entire assortment it was difficult to choose only one product, but I decided for Ecstasy Shine Lipstick – 502 Drama. This special, spectacular creation expertly combines three desirable cosmetic features: light, radiant lipstick that colors the lips, gentle balm that moisturizes and nourishes them and lively gloss that, with its magical seductiveness, highlights and enhances the nuances. Ecstasy Shine uses slow top filling technology to produce fine crystallization and a sheer, creamy texture. 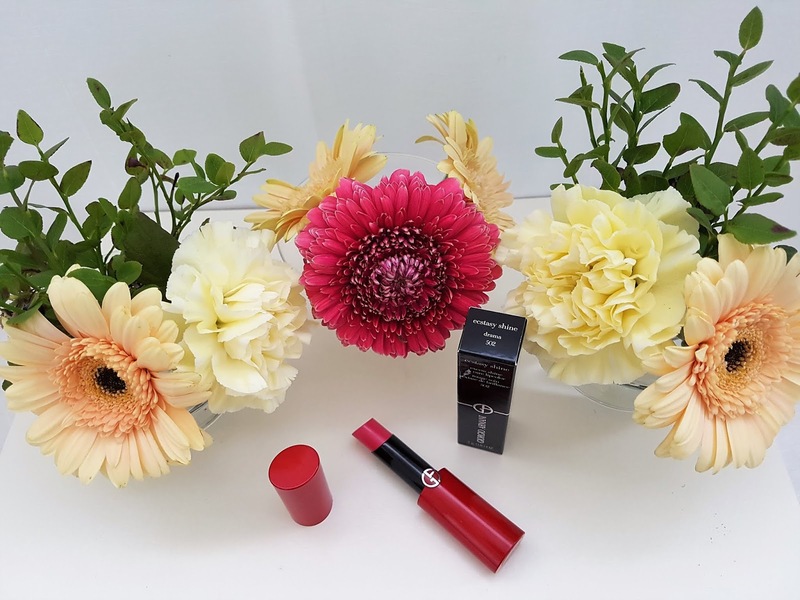 The lipstick, as stated on the official site, is youthful, energetic, vibrant and funky, formulated for easy and quick application, imparting playful, rhythmic jolts of saturated hues, graceful luster and sensual texture. Twice softer than the traditional lipsticks, 502 Drama, along with 18 different shades of Ecstasy Shine, provide 8-hour hydration and a luminous flash. 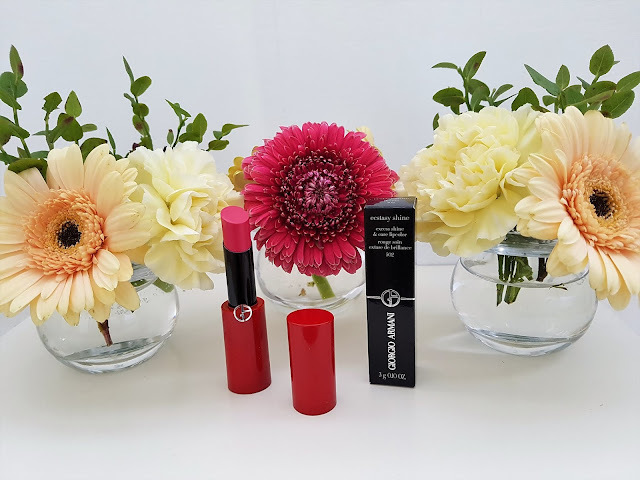 I'm exceptionally satisfied with this lipstick of high sheen, comfortable texture, enduring color and hydration, and my pink shade is perfect for summer days. When I apply it I don't get the sensation that it's even on my lips. However, after eating, it is necessary to fix it slightly. Also, I'm pleased with the fact that the packaging is in my favorite color red, with a recognizable logo in the middle. A magnet that automatically links two halves together is what distinguishes it from classical packs, which seems pretty convenient and at the same time practical – the lipstick can't be accidetally opened and is suitable for jauntily carrying in the purse. It's impossible to put in words my thrill for this product. 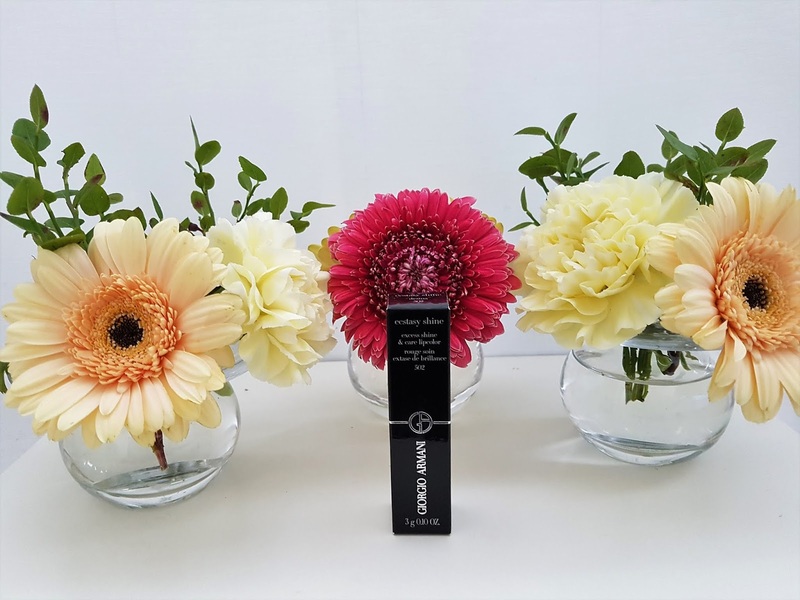 In addition to shiny finish, creamy texture and refreshing hydration, you can use it over the day or for nights out, without the fear of dry lips or lack of consistency. 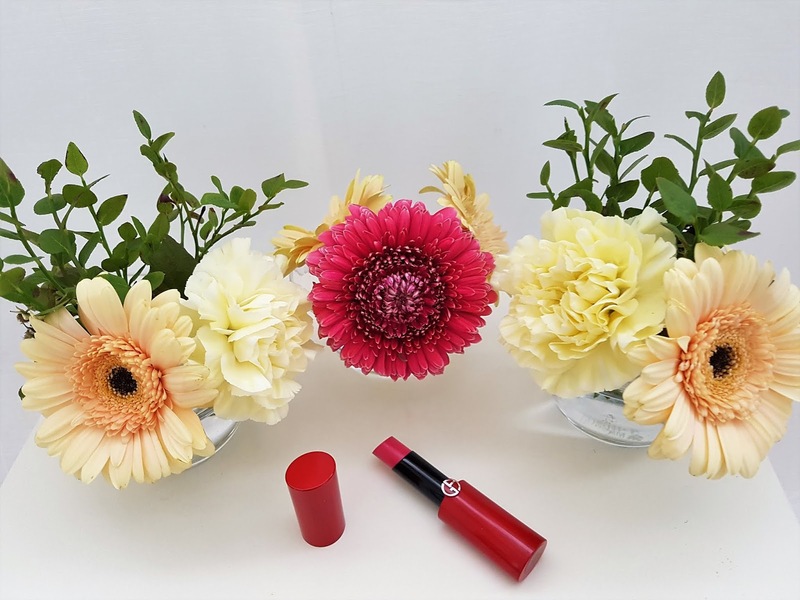 As the fashion virtuoso, who with the equal ardor is devising garment and cosmetic excellence, himself says: lipstick, lip gloss and lip tint are signatures of every woman. 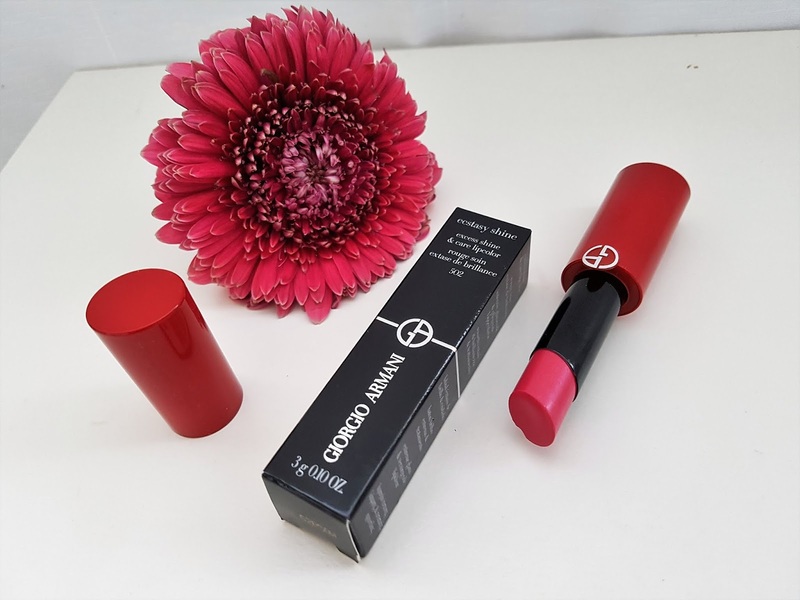 Have you tried this or some other Armani lipstick, lip gloss or lip tint? What are your impressions? Please write me in comments. Yes of course. I will start follow you! I've never tried this, but it looks wonderful!! Yes, the lipstick is really wonderful! If you try it let me know your impressions! 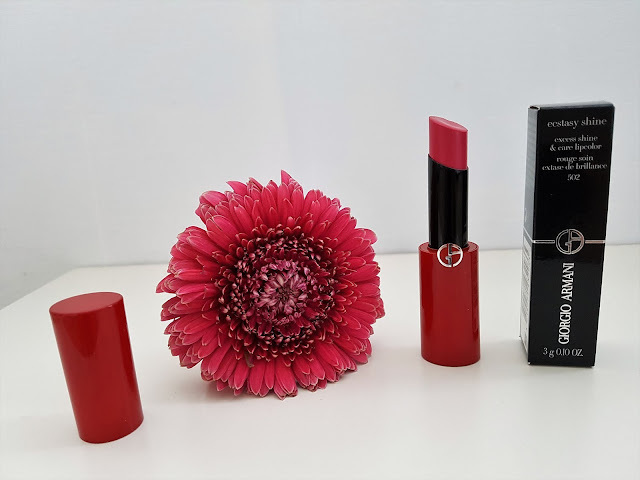 What a lovely lipstick, I loved both the color and the packaging. Have a great day! Thank you so much! I'm glad you love this product! This looks and sounds like such a great lipstick! I've used their liquid lipsticks and love the pigment and how they apply. Thanks for sharing, girl, and I hope you're having a great day so far! Yes, it is really great product! I didn't try their liquid lipsticks, but I'll plan to do that and write review here. Looks like a great lipstick. Red is my favorite colour also. Yes, it is gorgeous product! I really like it! I'm glad to hear that you share the same love for red color like I. Have a nice evening! Have a lovely evening... Hugs from London! Thank you so much for your kind words. It means a lot for me. Also thank you for information about follow/unfollow situation because today I changing some things in Settings and I didn't know that i unfollow people. I didn't plan to do that! Now I start follow you again. If you want to follow me I have Subscribe box in left corner, under information about e-mail, Instagram and Bloglovin account. You can try there and if you have some problem, please let me know that I can check maybe something is not working properly. How great it is to find such nice and comprehensive person! :) Thank you! I think I added myself, I followed the instructions. Please verify. I also have Bloglovin if you want. I realize where was the problem and now I'm going to fix it. I just started follow you on Bloglovin! Yes I completely agree with you. The color is gorgeous! Sjajan post, draga moja. Nisam probala ovaj ruž, ali mi deluje kao veoma kvalitetan. Zapratila sam te, pa se nadam da ćeš uzvratititi. Hvala! Hvala ti puno! Da ruž je iznimno kvalitetan. I ja sam tebe zapratila, tako da sada jedva čekam tvoj nove postove! I also always think about hydration, especially during summer and searching for lipsticks that can give me it. This lipstick is perfect for that purpose. I completely agree with you. The color is really perfect! I love a good red lipstick also. 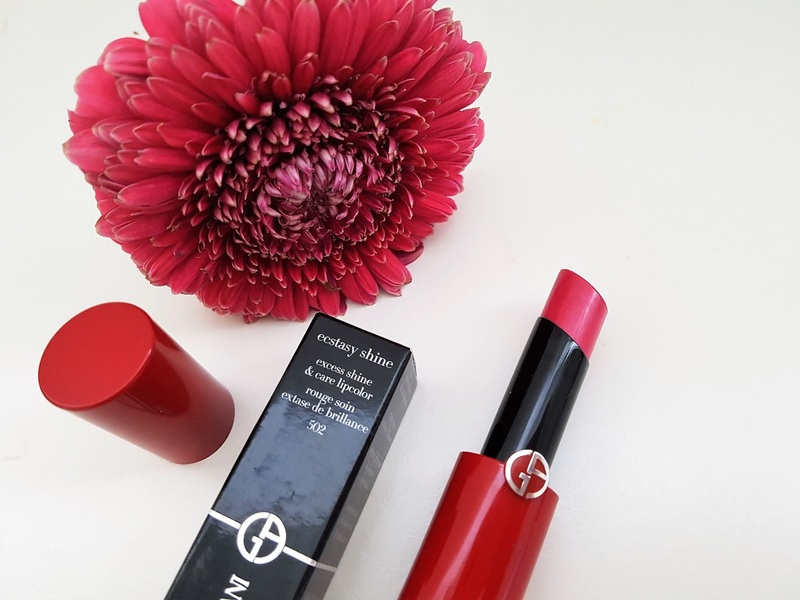 You can never go wrong with red and I love that this lipstick is hydrating too! We share the same opinion about red lipsticks! Looks amazing. Love red. I reach for it every time! I chose red during autumn and winter, while during summer I prefer pink or coral shades. I'm glad you love it because color is really fantastic. What a gorgeous shade! And I love the classy packaging! I completely agree with you, the color is gorgeous and packaging also. beautiful pictures, beautifully present the cosmetic :) is very interesting, I would like to meet him - gorgeous color! Yes, I completely agree with you. The shade is gorgeous! You are welcome. Yes, color of this lipstick is amazing! In comparison with some another lipsticks isn't too pigmented, but I want this level of pigmentation for summer. 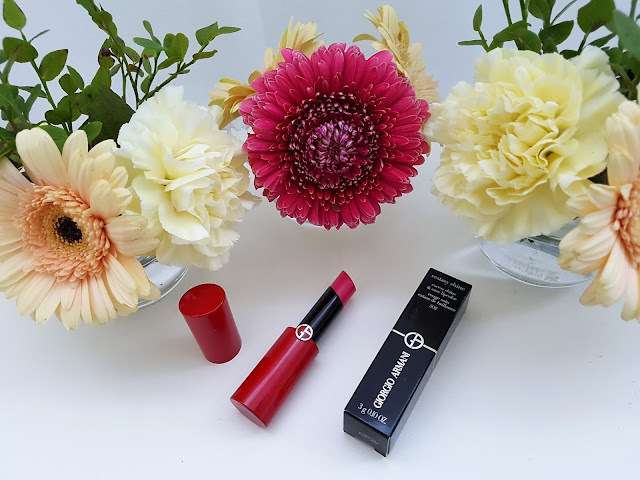 If you want more pigmentation check Rouge D'Armani, Lip Maestro and Lip Magnet. They have higher level of pigmentation. Izgleda predivno,jako mi se dopada nijansa! Super post! Hvala ti puno! Da nijansa je predivna! That color is gorgeous!! Sounds like they have an amazing lipstick collection! Yes they have awesome lipstick collection with different lipstick, lip tints and lip shines. You should check them. Yes, this lipstick is awesome. 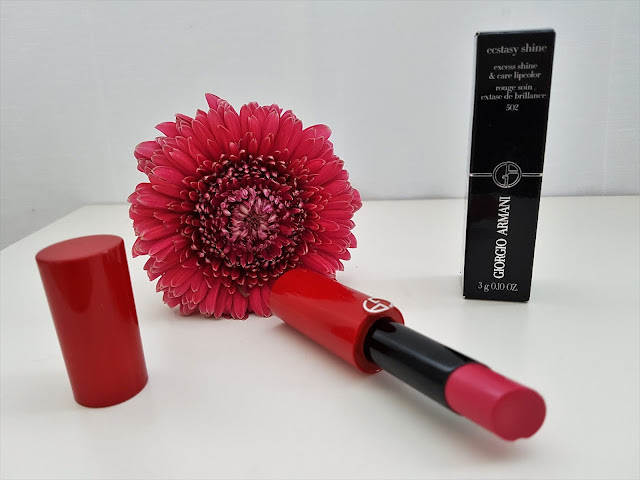 I agree with you about lip tint, they are awesome for creating easy and effortless looks. Love that color! You know, I haven't tried any Armani lip products yet, so I've really been overdue to give them a try. Good review - thanks for posting! Thank you so much Amy. This is first Armani lipstick in my collection and I'm very satisfied. Definitely I plan buy Rouge D'Armani, Lip Maestro and Lip Magnet and try it. 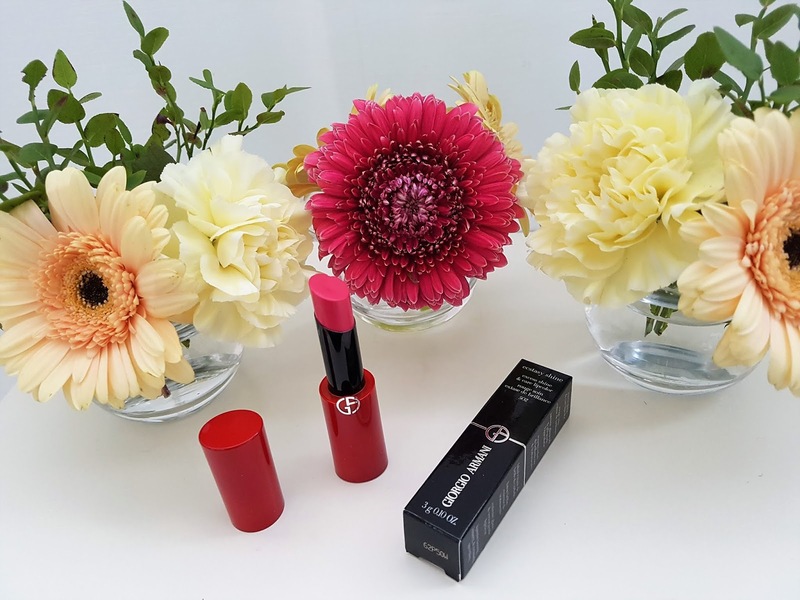 If you buy some Armani lip products let me know your impressions! Yes, Jae this is awesome shade. I'm glad you like it. I'm glad you love this shade Sharan! It's amazing! What a fabulous shade! I really like it! Thanks so much! I'm glad you like this shade Kelly. It's is gorgeous and perfect for summer. Lovely photos. Red is a really nice striking color. I completely agree with you Kathrin about red color. Yes of course, I just start follow your blog and accounts on Instagram and Bloglovin. Dear Melody, thank you so much for your kind words! I'm really happy to hear that you enjoy reading post. Wish you a beautiful weekend, too. Yes, brand is great and they have awesome products. In this post I didn't take photo of lipstick on lips, but I plan do that in the future posts. Dear Sara I'm very happy to hear that you really like this shade. I wish you lovely weekend! Love the shade! Would love to try this brand. I'm glad you love it! If you try it, let me know your impressions! Dear Sofia, I'm glad because you love the color. I love the color, lovely post. Thank you so much. I'm glad you love the color! Hvala ti puno draga Milice. Tvoje pohvale mi mnogo znače i drago mi je čuti da ti se sviđa način na koji predstavljam proizvode. Ruž je izuzetno kvalitetan i izbor nijansi je jako veliki. Bilo je teško odlučiti se samo za jednu. Dear Laura, yes it is. Shade is perfect for summer. I'm glad to hear that you share the same love for this lip colors like I do. 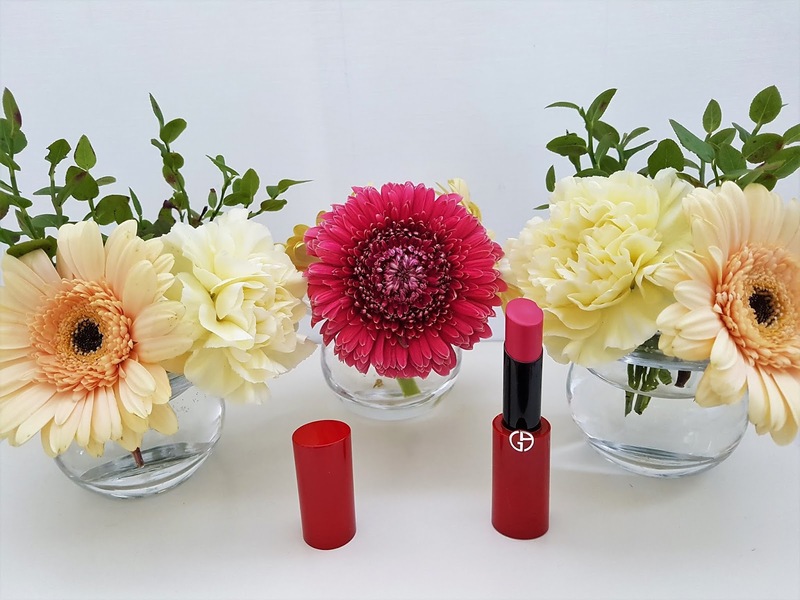 Yes, this lipstick is awesome, have a beautiful texture and great variety of shades. You should try it. I neither ever tried Armani lipstick but the colour of this one is fantastic! this color is really fantastic. If you try lipstick, let me know your impressions! That is such a beautiful colour and looks easy to glide on the lips. One think I always hated about MAC was how it wasn't easy to use there lipsticks to go perfectly on the lips. :) This brand looks more my style as well. Yes, you have completely right. 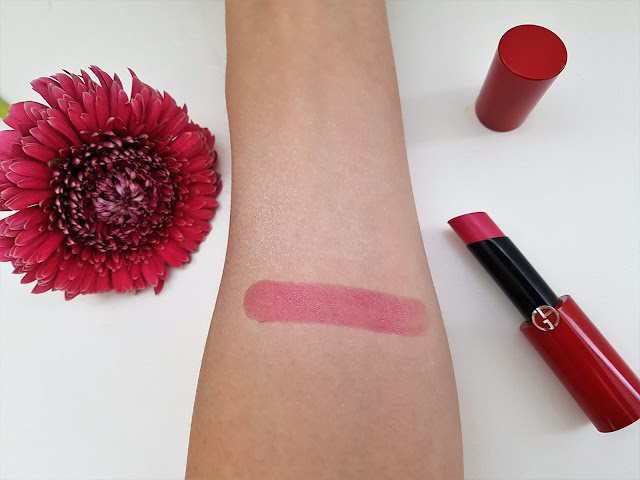 Lipstick easy glide on the lips and left beautiful shade. If you try it, let me know your impressions! I'm glad you love this shade. Of course I'll keep posting. I just start follow your blog and I hope that you will follow me. Yes it is very nice shade and really love this lipstick. I hope so that you relax during the weekend, because my was very busy but exciting. I wish you beautiful week. Very nice combination of red and pink shade, packing is so attractive. We share same opinion about this lipstick. I adore red packaging and pink shade. It was my favorite lipstick this summer.